Digital Publishing – Are the best things in life free? 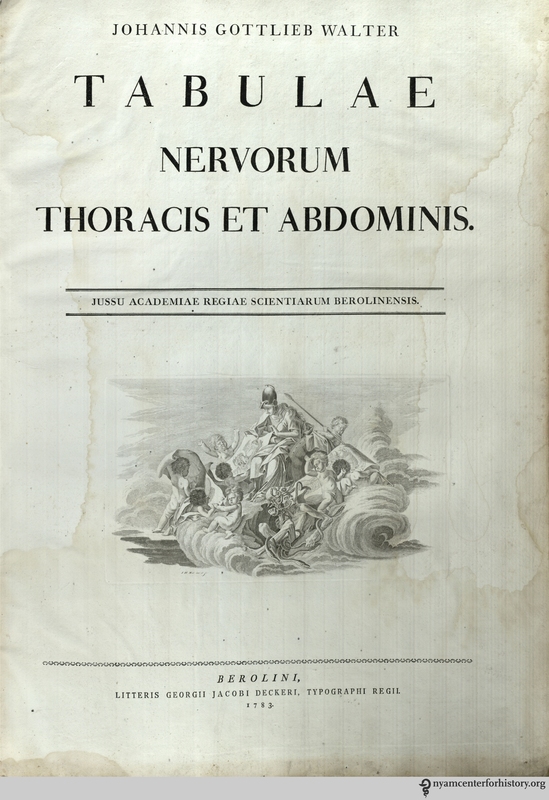 The title page of Tabulae nervorum thoracis et abdominis. Click to enlarge. In 1783, Walter’s Latin-language Tabulae nervorum thoracis et abdominis was published in Berlin. He had reputedly dissected more than 8,000 cadavers, and he maintained a collection of nearly 3,000 anatomical specimens purchased by the King of Prussia for the Anatomical Museum of the University of Berlin.2 Walter’s great skill as a dissector and his ability is well demonstrated in the illustrations of this text. Walter dedicated this work to William Hunter, John Hunter, and Petrus Camper. William Hunter (1718–1783) was a Scottish anatomist and physician. He was a leading teacher of anatomy, who guided and trained his more famous brother, John (1728-1793), one of the most distinguished scientists and surgeons of his day. The Hunterian Society, founded in 1819, was named in John’s honor, and the Hunterian Museum at the Royal College of Surgeons of England preserves his name and his collection of anatomical specimens. Petrus Camper (1722–1789) was a Dutch physician and anatomist interested in comparative anatomy and paleontology; he also invented the measure of the facial angle. Camper was also a sculptor and a patron of art. This book contains four numbered plates depicting the nervous system of the thorax and abdomen, each accompanied by an outline drawing. All plates are signed by “I.B.G. Hoppfer, ad nat. delin” and “I.H. Meil, sculp.” “Ad nat. delin” indicates that Hoppfer drew from nature, while “sculp.,” or sculptor, would today mean “engraver.” Plates I-II are dated 1777; plates III- IV were completed in 1778. An English-language translation of Walters’s Tabulae was published in 1804, entitled Plates of the Thoracic and Abdominal Nerves, reduced from the original as published by order of the Royal Academy of Sciences at Berlin. The NYAM library owns this English translation as well. The 2014 New York State Discretionary Grant for the Conservation and Preservation of Library Research Materials funded the conservation and rehousing of 24 oversize 19th-century German illustrated medical atlases, including Johannis Gottlieb Walter Tabulae nervorum thoracis et abdominis. Although all of the atlas volumes were represented in the library’s card catalog, they had not been entered into NYAM’s online catalog prior to the grant’s completion. 1. Julius Pagel: Walter, Johann Gottlieb. In: Allgemeine Deutsche Biographie (ADB). Band 41, Duncker & Humblot, Leipzig 1896, p. 26. 2. Bibliographic note in NYAM’s copy of Tabulae nervorum thoracis et abdominis. This entry was posted in Collections, History of medicine and tagged 18th century anatomy, anatomy, Johann Gottlieb Walter, New York State Discretionary Grant for the Conservation and Preservation of Library Research Materials, Plates of the Thoracic and Abdominal Nerves, Tabulae nervorum thoracis et abdominis by nyamhistorymed. Bookmark the permalink.